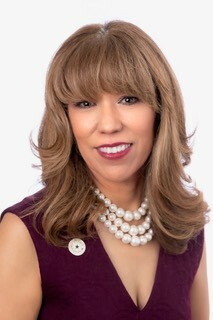 Dr. Cynthia Teniente-Matson is the second president of Texas A&M University-San Antonio (A&M-SA), one of the fastest-growing universities in Texas and the only Texas A&M System university located in a major metropolitan city. Since becoming president in 2015, Dr. Teniente-Matson has forged an audacious strategic plan for the University to fulfill its mission and bring to life its core values while achieving several important goals, including becoming a national model for student and academic success. Among her many accomplishments at A&M-SA, Dr. Teniente-Matson led the successful transformation to becoming a designated Hispanic Serving Institution (HSI) and a comprehensive four-year university, welcoming the University’s first freshman class in 2016. She also led several new strategic initiatives, including the creation of the Mays Center for Experiential Learning and Community Engagement through private funding in addition to securing the Chancellor’s Research funding for the Institute of Water Resource Science and Technology fulfilling vital components of A&M-SA’s newly revised Master and Academic Plans. Under her leadership, the University has strategically positioned itself to implement deliberate practices designed to improve and enhance student learning and degree attainment, especially for first-generation students. These include new academic programming such as Jaguar Tracks and High-Impact Practices (HIP) integrated into the curricula for all students. Diversity, inclusion and equity are at the forefront of her leadership philosophies. In 2017, she orchestrated the President’s Commission on Equity (PCOE), which is charged with building a culture of excellence that values equity and inclusion on campus. Through Dr. Teniente-Matson’s copious efforts, A&M-SA is providing equitable opportunity and support for all its members. Dr. Teniente-Matson has more than 25 years of experience in higher education with a track record of achievement that supports campus growth, including faculty and student success, economic development, financial stewardship and broad-based entrepreneurial leadership. Prior to her appointment at A&M-SA, she worked as Vice President for Administration and Chief Financial Officer (CFO) of California State University Fresno. Dr. Teniente-Matson has been recognized for her leadership and service in the field of education, including receiving the Making a Mark on the World Innovation Award from the San Antonio Hispanic Chamber and the Women’s Leadership Award from the San Antonio Business Journal. She is also a sought-after speaker and mentor on contemporary issues in higher education leadership. A San Antonio native, Dr. Teniente-Matson is deeply committed to giving back to the community that has given so much to her. She served as President of the San Antonio Tricentennial Commission, and she is on the boards of the San Antonio Chamber of Commerce and the San Antonio Hispanic Chamber of Commerce. She is also a national thought leader on higher education issues, serving on the board of directors for the American Association of State Colleges and Universities (AASCU) and on the board for Higher Education Resource Services (HERS). An advocate of continuing education, Dr. Teniente-Matson earned a Bachelor of Arts in Management from the University of Alaska Fairbanks, a Master of Business Administration from the University of Alaska Anchorage and a doctorate in Educational Leadership from Fresno State. Dr. Teniente-Matson and her husband Mike are parents to two sons, Phillip and Wyatt.